"Are you sick & tired of figuring out on how to use Google Adwords to promote your products & services?" "Here's How You Can Run Your Advertizing Campaigns Using Google Adwords Pay-Per-Click System With These Step-By-Step Video Tutorials"
"In Just A Few Hours Following My Step-By-Step Online Video Tutorials, I'm Confident You Will Be Able To Start Running Adwords Campaigns That Bring In Traffic To Your Website"
Suppose you could learn detailed step-by-step video tutorials on how to run your advertizing campaigns using Google Adwords Pay-Per-Click system. Why spend the next weeks and months trying to figure out all of the steps it takes to get things going properly -- when you can watch someone show you exactly how to take action and get your Adwords campaigns up and running today? I'll Top Up Your Fool-Proof Passport To Success With My Unconditional 100 Iron Clad Money-Back Guarantee! Also, if at any time whatsoever within the next 8 weeks, you feel for any reason that our product fails to live up to my promise, simply let me know and I'll immediately give you a 100 refund of your purchase price, no questions asked. Yes (Your Name)! I want to be able to set up my own Google Adwords campaigns so that I can start saving money and get them up and running qucikly. Please give me immediate online access to Google Adwords Pay-Per-Click Basics! 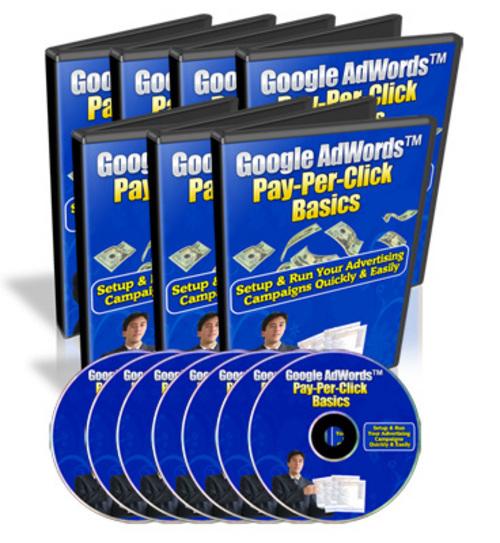 I understand that I will receive the Full Master Resale Rights To Google Adwords Pay-Per-Click Basics! I'll be able to use the same sales copy and website design, and keep ALL the profits for life! My investment could potentially pay off hundreds of times, and possibly in the next few hours! I understand that this offer has a 8-week ironclad money-back guarantee. I have 8 weeks to review Google Adwords Pay-Per-Click Basics and if it does not deliver what it promised, I can return it for a prompt and courteous refund. I also understand that my credit card will be charged $17. P.S: Just think! Youll never again suffer through the pain and hassle of trying to figure out how to set up your Google Adwords campaigns. Now, you can get these tutorials all shown for you, practically handed to you on a silver platter. You simply watch the videos at the comfort of your home...and youre practically done in a few hours! P.P.S: Remember that you've got nothing to lose with my 8-week ironclad money-back guarantee. You have 8 weeks to review Google Adwords Pay-Per-Click Basics and if it does not deliver what it promised, you can return it for a prompt and courteous refund. P.P.P.S: Look at it this way -- $6 is really a painless drop in the bucket compared to the time & money you're going to waste trying to figure it our all by yourself.